Commodity releases can have catastrophic consequences, so ensuring pipeline integrity is crucial for pipeline operators. 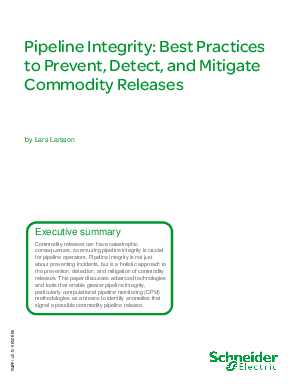 Pipeline integrity is not just about preventing incidents, but is a holistic approach to the prevention, detection, and mitigation of commodity releases. This paper discusses advanced technologies and tools that enable greater pipeline integrity, particularly computational pipeline monitoring (CPM) methodologies as a means to identify anomalies that signal a possible commodity pipeline release.